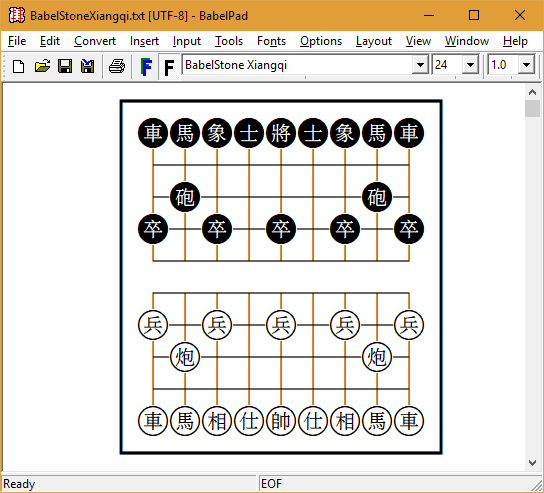 BabelStone Xiangqi is a font covering the Xiangqi 象棋 (Chinese chess) symbols in the Chess Symbols block of the Unicode Standard. These symbols were proposed for encoding by myself in September 2016 (see WG2 N4748), and were added to Unicode version 11.0 in June 2018 (code charts). 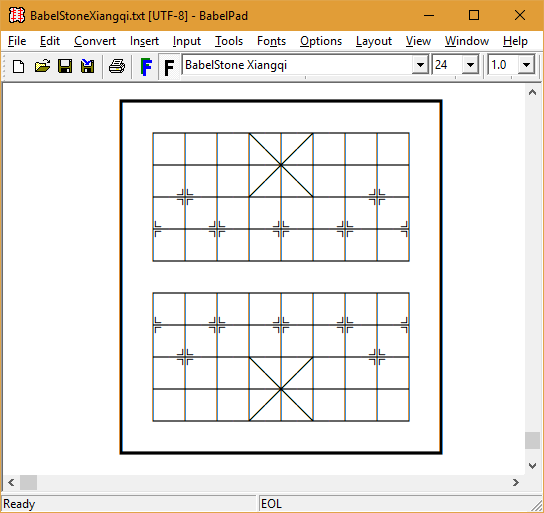 BabelStone Xiangqi with black and white glyphs for the Xiangqi game pieces. The red pieces are depicted as black Chinese characters on a white background; and the black pieces are depicted as white Chinese characters on a black background. 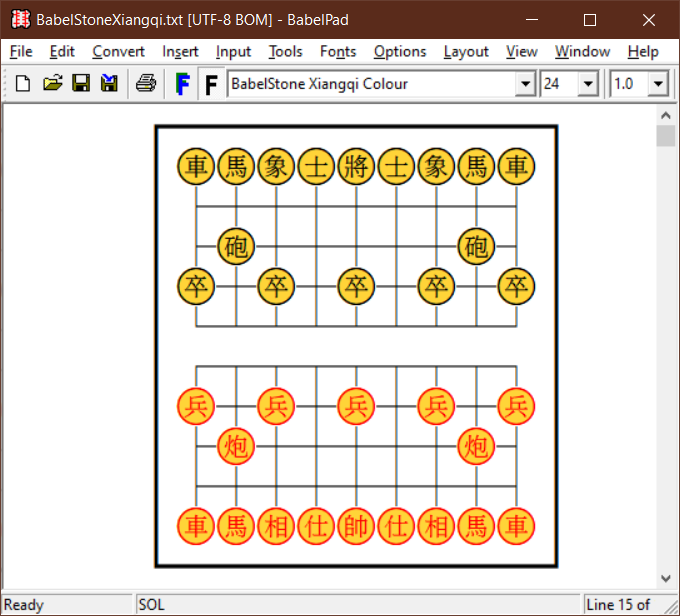 BabelStone Xiangqi Colour with colour glyphs for the Xiangqi game pieces. The red pieces are depicted as red Chinese characters on a sandy yellow background; and the black pieces are depicted as black Chinese characters on a sandy yellow background. Colour fonts are supported by most modern browsers, and some applications such as Microsoft Word 2016. Applications that do not support colour fonts will render the Xiangqi glyphs in black and white (the same as for BabelStone Xiangqi). The font also includes box drawing characters to facilitate the drawing of Xiangqi game boards and game diagrams. However, the set of box drawing characters in the Unicode Standard do not include characters with horizontal/vertical and diagonal lines that can be used to draw the castle, or characters with emphasized intersections that can be used to mark the positions for the soldiers and cannons. Therefore I have included twelve glyphs for these unencoded characters in the Private Use Area (PUA) at U+E000 through U+E00B. BabelStone Xiangqi is licensed under the SIL Open Font License 1.1, which means you are free to use it for personal or commercial purposes, and to redistribute it by itself or as part of a free or commercial software package, just as long as you do not sell the font on its own. The license also allows you to modify the font in any way you like, as long as the modified font does not use "BabelStone" in its name. Please read the license for details. For use on your computer or mobile device please download and install the TTF file. The WOFF and WOFF2 files are for web use only, and are not required by most users.